‘Peculiar Penguins’ can be summarized as ‘love story in the Antarctic’: a penguin falls in love with a girl, blows it, but saves the day by rescuing her from a terrible shark. Being one of the weaker entries in the Silly Symphonies, ‘Peculiar Penguins’ nevertheless contains some fine animation, especially in the under water chase, which is literally packed with special effects. 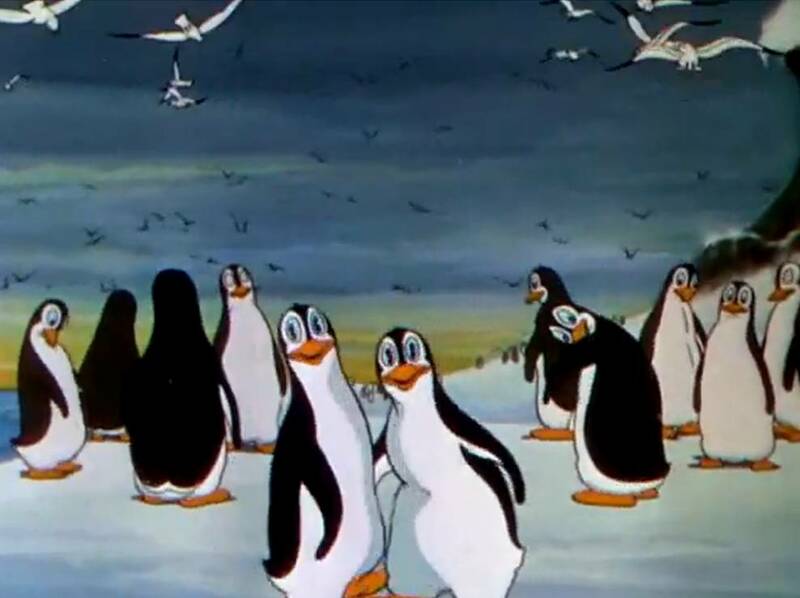 Like in ‘Funny Little Bunnies‘, the setting is introduced by a sugary song, accompanying a complex opening shot, with lots of penguins moving and seagulls flying in it. Ten years later Disney would return to the Antarctic to tell about a particularly peculiar penguin called Pablo in ‘The Three Caballeros‘ (1944). It’s Christmas and a poor lady drops by Mickey and Minnie’s house to leave a box at their doorstep. This box contains an endless quantity of little kittens, which are taking over the house within seconds. Soon, the house is near complete destruction. This is partly Mickey’s own fault, because dressed up as Santa he gives the little brats toys like hammers, saws, drills, axes, and even guns and canons. 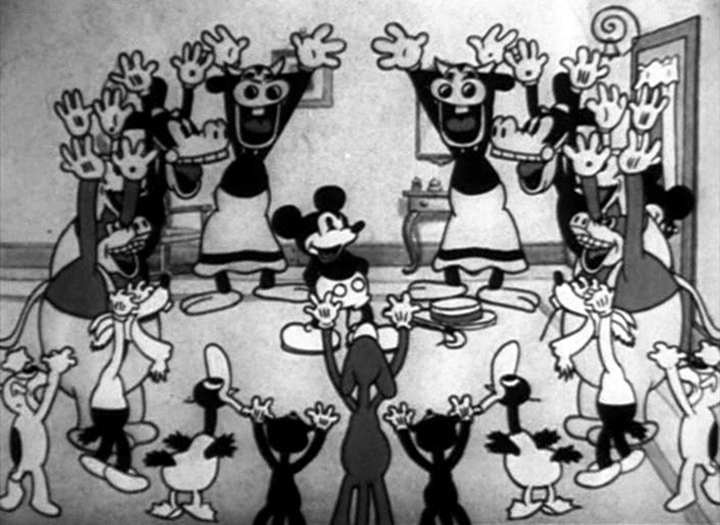 ‘Mickey’s Orphans’ is the first of no less than four Mickey Mouse Christmas cartoons, the others being ‘Mickey’s Good Deed‘ (1932), ‘Pluto’s Christmas Tree’ (1952) and ‘Mickey’s Christmas Carol‘ (1983). It was nominated for the very first Academy Award for animated short film, but it understandably lost to the first technicolor short ‘Flowers and Trees‘ (1932), although Walt Disney did get a special Academy Award for the creation of Mickey Mouse. 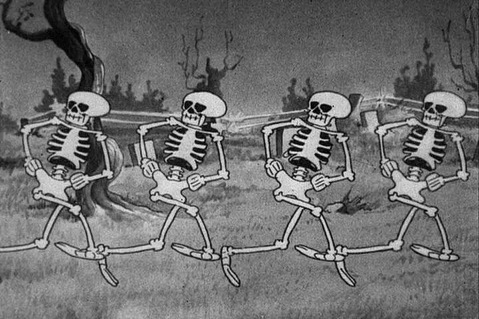 ‘Skeleton Dance’ is the first of the Silly Symphonies and easily one of the best. It deservedly even ranks among the best cartoons of all time. It starts spectacularly to begin with: we first watch lightning crack, immediately followed by an extreme close up of huge eyes, which only after the camera zooms out appear to belong to an owl. The complete film is simple, yet perfect in its timing and its peculiar mix of eerie atmosphere and silly gags. The animation (which includes a remarkable quantity of repetition) is extraordinary fluent and the skeletons are convincing throughout the picture. More than in any earlier cartoon the animation and music are a perfect match. 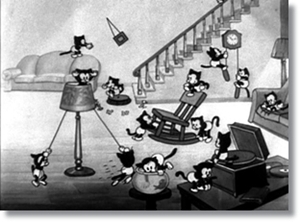 This cartoon single-handedly puts Walt Disney, animator Ub Iwerks and composer Carl Stalling to the eternal hall of fame. A masterpiece. ‘The Skeleton Dance’ clearly shows Disney’s ambition. From now on Disney would use the Silly Symphony series to propel the art of animation forward, until the series ended 1939, after becoming a little obsolete, because their role had been taken over by the animated features.